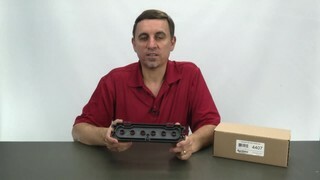 I’m Jay, and this is the Aprilaire 4407 distribution tray. It is located on the inside of the humidifier, installed on top of the pad frame. The purpose of the tray is to act as a reservoir for water, before it is distributed onto the water panel. Within the tray are six holes, along with a fabric liner used to evenly disperse water. This material is necessary for your humidifier to function properly. The tray should be replaced every five to eight years – sooner if the fabric liner is damaged or missing. This item is also available as part of the maintenance kit for your model. Replacement is easy. Here’s how. Be sure to turn the power off before performing any maintenance. Before performing this service, it is necessary to shut off the water. Find the saddle valve, turn it clockwise until it stops. There’s no top or bottom to the water panel. Simply slide it into the scale control insert, like this. Here’s the distribution tray, this side here with a little loop must be on the same side as the floats. Snap this into position. Now we’re going to take the float cover, install the floats in it, snap it into position. There are two snaps, one on each side. They must be engaged. Again, there’s a little loop here that must face the same side as the floats. This side will now go towards the inside of the humidifier, this side will go towards the furnace or ductwork. The assembly is now ready to be installed inside of your Aprilaire humidifier. Thank you for watching. For this and other products, visit us at aprilaireparts.com.